Your tour will visit eight food tasting locations, each carefully chosen to highlight the best local flavors that Nassau has to offer. Enough for a hearty lunch the tastings are served from locally adored eateries, unique specialty food stores, and family owned ethnic restaurants. You’ll have an exclusive opportunity to learn about these foods from the charismatic entrepreneurs, chefs & local artisans who prepare and preserve these cultural traditions. 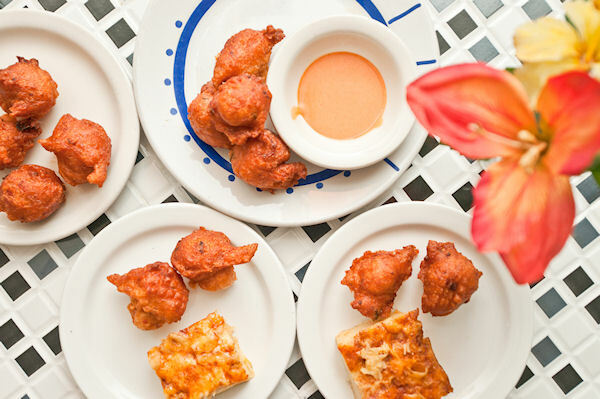 Stops include: a favorite family owned “downhome” eatery serving soul-warming Bahamian classics, locally sourced jams, salts and island bush teas from a specialty spice merchant, Nassau’s best Jamaican food and an organic, fair trade Chocolatier featuring hand-made truffles by an award winning pastry chef. Between tastings, you will experience the country’s political and commercial center through the eyes of several generations as you stroll the charming tree-lined streets of Nassau’s historic downtown neighborhood. Our enthusiastic local guides share their knowledge and recommendations of architectural gems, enchanting local flora, fascinating colonial relics, hidden venues for live music, poetry and dancing and exciting local attractions and restaurants. Discover why natives are proud to call Nassau home. You simply won’t find any other way to experience the city this authentically and you’ll leave with unforgettable (and delicious) dining memories you will treasure for years to come. After the guided tour, explore Nassau’s Downtown neighborhoods with confidence and take advantage of thoughtful recommendations from your local guide on the area’s full spectrum of restaurants, attractions, entertainment and cultural offerings. Please note that this tour is not suitable for wheelchair guests due to several hills, challenging sidewalks and flights of stairs at several of our tasting locations. Please note this tour is not available on Sunday. Please wear comfortable clothes and walking shoes, as well as sun protection. Don’t forget to bring along your camera. Tour runs rain or shine. This tour is not suitable for wheelchair guests due to several hills, challenging sidewalks and flights of stairs at several of our tasting locations. Please note this tour is not available on Sunday.